To the west of Johannesburg, in a valley scattered with unremarkable koppies, shrubs and the odd tree – dry in winter and green in summer – lies the 47 000 hectare World Heritage Site known as the Cradle of Humankind. About 40 different palaeo-anthropological sites, including Sterkfontein, Swartkrans, Kromdraai, Coopers B and Wonder cave, have unearthed some of the world’s most important fossils. Mrs Ples (make that Master Ples, as some believe), dates back some 2.5 million years, and Little Foot, completely excavated only in late 2005, is an almost complete ape-man skeleton that is 3.3 million years old. If that weren’t enough to place this part of the world on the map, a further 500 hominid fossils and over 9 000 stone tools have been excavated here. Whilst the work is by no means complete, 40% of the world’s human ancestor fossils have already been found in and around the series of caves here as well as evidence of man’s earliest known mastery of fire. The ancient Sterkfontein cave system, highly popular among visitors and the most famous of the fossil sites, has also revealed thousands of animal fossils and over 300 fragments of fossils wood. The cave is also the site of a beautifully calm underground lake, at a depth of 40 metres (the cave descends to a depth of 60 metres), and locals hold that the water has sacred medicinal properties. 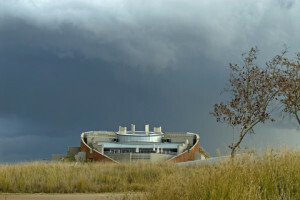 10 kilometres from the Sterkfontein Caves is a state-of-the-art visitors’ facility named Maropeng – Setswana for ‘the place where we once lived’ – an apt name for a centre that brings the history of humankind alive in interactive displays, restaurants, a marketplace, an outdoor amphitheatre and a hotel. The centre has already won various awards for its originality that includes a huge tear-shaped mound, referred to as the Tumulus. Whilst it’s designed to look like an ancient burial mound in front, the rear side is a very different and modern-looking structure, and the experience inside the Tumulus a novel exploration of our history. See http://www.maropeng.co.za/ Telephone: +27 (0)14 577 9000.